The Utahraptor (Yoo-tah-RAP-tor) or simply Raptor is one of the dinosaurs in ARK: Survival Evolved. Raptors will attack dinosaurs and players on sight. They often attack with a "run-and-bite" strategy and can pounce at smaller targets than itself or of equal size holding the target down making them unable to move, making it difficult to defend against an onslaught. A dangerous predator to encounter in the dark, Raptors are nearly impossible to fend off when attacking in packs and aided by darkness. The Raptors often attack from different directions, using this method to take down prey while avoiding damage. Due to their high speed and ability to vocalize for pack buff (if in a pack of 3 or more), they are hard to flee from during a player's early levels, and it is advised to make for deep water if attempting to flee an attack or run behind a door and immediately shut it. The Raptor is a relatively small dinosaur with feathers on the head, back, tail, and on the backs of the arms. They come in a variety of colors, although green and reddish brown seem to be the most common it is rare in the color black. This section displays the Raptor's natural colors and regions. For demonstration, the regions below are colored red over an albino Raptor. The colored squares shown underneath each region's description are the colors that the Raptor will randomly spawn with to provide an overall range of its natural color scheme. Hover your cursor over a color to display its name and ID. For example, "cheat SetTargetDinoColor 0 6" would color the Raptor's "body accent" magenta. For example, "cheat SetTargetDinoColor 0 6" would color the Raptor's "inner body" magenta. The Tek Raptor is a creature that was permanently added to the game in the Extinction Chronicles III event. 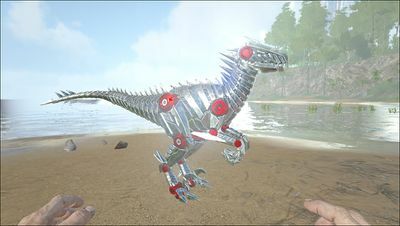 It is a unique alternate of the original Raptor, and is purely made of Tek. Unlike the original, they spawn at a 5% rate at a 20% higher level than usual. Start with a thrown Bola to keep it from pursuing you. Once it's immobile, use Tranquilizer Arrows (headshots result in quicker knockouts). Do this carefully; it should not take very many. Once it is unconscious, use Narcotic. Narcotics and Prime Meat will tame it more efficiently. Narcoberries and Raw Meat also work. Keep a sharp lookout for other Raptors as they often come in groups, and for other predators, as they are frequently found in high-traffic areas; unless you have a large herd of supporting dinos or a number of tribemates to help out, you may have to take the time to find an isolated Raptor, which can take a long time, or kill off the extra creatures.When a raptor is alone, wait for it to kill another dino and tranq it while it is feeding on the corpse. When in pack of 3 or more, the Raptor of the highest level in the group gets the Alpha boost upon making use of vocalization for 45 seconds. The Alpha has a glowing red cloud around it to indicate its status whereas the rest has an orange cloud next to themselves. Tamed Raptors also have a bonus for each member of the pack : so a pack of three Raptors or more will receive a +1 Bonus, which will go up to +X in a Group of X+1 or more Raptors (max amount of X is 4). It seems like the boost/vocalization buffs don't work with bred raptors on the latest updates. They run fast and attack faster, so be prepared for a quick reaction, usually a player with good speed and stamina can outrun them, but be aware, they can be persistent. Always check the Raptor's surroundings and be prepared, they have a good visual range. Raptors can often be found in packs of two or more, depending on the zone you will find them close to the shores, or deep in the jungle. Raptors can be tamed in different ways. One way you can tame them is by using bolas on them and then knocking them out. The best strategy is to keep distance or heavily engage with them, depending on your stats, armor and weaponry. At first you may want to avoid them. One trick is to run to a herd of trikes, Stegos etc. and get the Raptors to hit and aggro them by accident, making a diversion or a means to gather lots of meat and hide. If a Raptor is a low level, a Spear can easily kill it, but beware, if they are in a pack of two or more, this strategy will not work! A way to kill high level ones, or two or more Raptors is to have a good climber, like a Thylacoleo, or a flyer. Then climb onto a big rock, as they are good jumpers, from there, shoot it with a Sling, Bow, Crossbow etc. It should die fairly quickly. Also, make sure the Raptor is not glowing red. If it is, that's an Alpha Raptor! One well placed headshot with a Crossbow can take out a Raptor with a level between 1-20. Since they are fast, try to make them run in a straight line and be ready for shooting. A full set of hide armor or other armor stronger than cloth armor and any weapon will also do. Raptors can be dangerous if they reach you from behind, eventually you will learn to recognize their steps on the ground and start running before this happens. If you or your dino's size are relatively smaller than them, they can pounce and render you immobile for some time. Try to take them out when they are engaged with some big animal if you want to easily kill them, just don't hit the bigger animal! Raptors have a very low Torpor tolerance, you can try to knock them out with a few punches if you have a high melee damage stat. Wild Raptors also make for awkward swimmers, and even a relatively ill-equipped survivor with a basic spear can lure them into the shoreline as a tide-turning last resort. If they have immobilized a target, they can't attack any other dino until they hopped off the said target, making them vulnerable should there not be any other Raptors nearby. They can be useful and lightweight for traveling, as far as their Stamina lasts, you may want to increase their Stamina if you want them for transport, or their health and attack damage if you want them to assist you on combat. They gather about the same or slightly more material per carcass than a Stone Pick, but finish gathering faster. They can also pounce onto smaller targets to temporarily immobilize them (and to kill them). If a survivor is on a certain mounted dino, Raptors can also knock them off their mount and immobilize them. Damage: A quick attacker with decent damage that can easily circle slower enemies, the Raptor makes for a good attack animal early on. It lacks the health and raw damage of the Direwolf and Sabertooth however. (Health and Melee Damage). Hunter: Similar to Damage, the Raptor is useful for collecting Hide and Meat once you have a saddle. Though metal weapons tend to deal more damage, the raptor's raw speed allows you to run from an unsuitable fight. (Health and Melee Damage). Hunting/Battle Pack: In a pack of 3 or more, the pack leader can temporarily vocalize for pack buff towards all others for 45 seconds(Level Damage and Health to all Raptors, with Stamina, Carry Weight, Melee Damage and Health added to the one ridden). Travel: Raptors are very fast, and make for good mounts for quick travel around the island. They cannot carry much, however, so they make for poor pack animals. They do carry a perk over flying mounts in that they can cover a lot of ground without much rest for stamina regeneration, and can hide in the forests and tall foliage if one wants to travel unnoticed. (Level Speed, Stamina, and Carry Weight). Light Cavalry Mount: With the advent of the ability to use melee weapons like Pikes and firearms like the Assault Rifle from the back of medium to small sized mounts, the Raptor can be very useful as a flanking cavalry mount by sprinting in and having the rider fire at close range or by allowing a sniper to rapidly circle around the enemy, fire, and then reposition or escape. Another particularly effective method is to use a Fabricated Sniper Rifle while at a distance, but you do need to be careful not to shoot your own Raptor in the head, and dive in and out of thick forest cover. This combines the effectiveness of long range with the speed and agility the raptor can provide, while not exposing the shooter like a flying mount would. If chased, just dart into the thicker forest and laugh as the enemy tries and likely fails to find you as you outrun all of their land mounts but can use the trees for cover against airborne threats. (Level Health, Stamina, and Speed, with Carry Weight as needed). Cave Mount: Sabertooths can be seen as an upgrade of the Raptor in terms of strength (in previous versions, now - Raptor is stronger), but it turns out that Sabertooths have difficulty with attacking airborne creatures because of their extremely low hit box and the fact that their jumps lack vertical reach. They can hardly handle a swarm of Onycs. Raptors have no problems hitting Onycs however, and are therefore the better choice. But you must keep an eye on your own health since airborne creatures deal damage to the rider, unless you ride a Megaloceros. Having a mount in caves has several advantages: Your food and water count drop slower, the mount can carry useful stuff, and they deal and take damage (Level Health, Damage, and Stamina). Early Prime Meat Hunter: As one of the first prime meat gatherer available for a player Raptor can hunt alone or in a very effective team with Ichthyornis. In the second case you just need to command the Ichthyornis to Hunt and Retrieve small creatures like Dodos and Lystrosaurus and the Raptor will do the butchering. 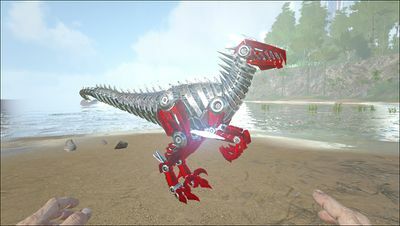 PvP: In PvP, Raptors are far better than any other fast small creatures, because they can pounce on target and completely immobilize a player. Alpha Raptors are NOT able to pounce or vocalize, because that would be too overpowered. Like many other Dromaeosaurids it is believed that Utahraptor did not use its sickle claw as a slashing weapon, but rather for stabbing. This is due to the very thick profile of the claw. Dromaeosaurs such as Utahraptor, Velociraptor, and Deinonychus likely used their claws to puncture arteries and even organs to cause internal bleeding, killing the prey quickly due to blood loss. They may also have used their sickle claw to hold onto their prey while using primarily their hands and teeth to deal injuries. 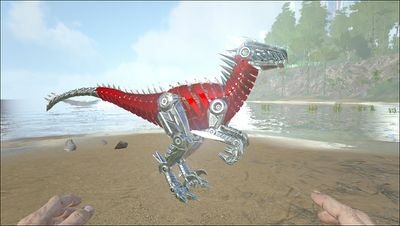 A raptor is one of the most famous mounts in ark. The species of Utahraptor ostrommaysorum was first studied and named after the release of the movie Jurassic Park, in which a similar dinosaur was erroneously called Velociraptor. The actual Velociraptor mongoliensis was about the size of a large turkey, and have only been found in Mongolia. The dinosaur from Jurassic Park was being excavated in the Badlands of Montana, while Utahraptor ostrommaysorum was discovered in the Dalton Wells Quarry of east-central Utah. Despite the Raptors in ARK being identified as a species within the genus Utahraptor, the skull seen in its dossier is of Velociraptor rather a member of the subfamily Dromaeosaurinae, which Utahraptor belongs to. The Raptor's in-game model, however, resembles Achillobator giganticus or dakotaraptor steini. Raptors often kill themselves by attacking stronger herbivores even with temporary pack boost. Some herbivores can even take out whole packs. The name of the Utahraptor means originally approximately "Utah plunderer". 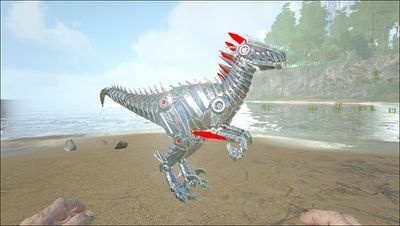 Raptors can be seen as the mascots of ARK. They appear in much of the promotional artwork and in one of the in-game holiday events. The Raptors in-game are depicted with only a few feathers, while their real-world counterparts would have had a full coat over their body. The Player can use weapons while mounted on this creature. The Name "Utahraptor prime" translates into "best Utah plunderer". Raptors received a major update during TLC Phase 2 that gave them a pack boost effect (similar to Direwolf), and the ability to pounce on and immobilize smaller creatures and survivors for the kill, similar to the Thylacoleo. Raptors utilize one of the older voice pack for pack boost vocalization. In ARK, the hands and clawed fingers on the Raptor's arms point downwards, whereas in real life, the hands of Raptors pointed inwards towards the chest, and had the best mobility moving side to side rather than up and down. If real Raptors hands were rotated like the ones in ARK, their wrists would be broken. Raptors has been one of the main cause of deaths for all survivors, with the total leading of 62,257 kills, leaded by Dilo with 30,715 and Trike by 24,686. This applies to all map but Extinction, with its main death cause at #5. Raptor with a color mutation. A group of players on Raptors. A player riding a Raptor. This page was last edited on 24 April 2019, at 12:04.